Tom James is set to return to his former club Bedford later this month as Doncaster Knights first choice scrum-half. 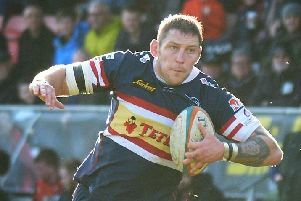 James moved to Castle Park at the start of last season in search of regular first-team rugby. And although he started in a number of games, and was on the bench in most of the others, he was still seen as No 2 to Michael Heaney. But with Heaney joining Premiership side Worcester at the end of last season James was given first chance of making the No 9 shirt his own this season despite the arrival of Fiji international Henry Seniloli. “I’m enjoying starting games,” said James. “I’m one of three No 9s who are all pushing each other. “It’s nice to have the trust of the coaching staff and be given a bit more responsibility but I’m not being complacent and I want to keep progressing and keep learning. “I’ve played with three different half-back partners in the opening month of the season due to injuries, which hasn’t been ideal, because you want consistency. “But we are fortunate in the fact that Charlie (Foley) and Kurt (Murtagh) are very good players and Cam (Cowell) did a good job standing in away at Richmond. Following successive defeats, James says Knights are desperate to get back to winning ways against visiting Jersey Reds this weekend. “They were a decent side last season and finished the season strongly,” he said. “They’ve made a bit of a slow start this season (although they beat Yorkshire Carnegie last weekend to pick up their first win). “Traditionally they are always strong up front and we’ve got to match them in that area of the game. “We’ve focused more on ourselves so far this season and we feel that we are a really strong side and have a strong squad and on our day are capable of beating any team in the league. “If we want to be up there challenging we have to make Castle Park a fortress and having lost against Ealing it’s very important that we beat Jersey on Saturday.